Have a thing for hexagons? 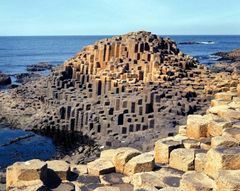 How about basalt hexagonal columns? There’s no better place to find such a rarity than at the Giant’s Causeway. Folklore has it that the Irish giant Fionn mac Cumhaill (Finn McCool) built the causeway to walk to Scotland to fight his Scottish counterpart, Benandonner. The more accurate, but less fun story behind the causeway states that during the Paleogene period, the region was subject to intense volcanic activity, when highly fluid molten basalt intruded through chalk beds to form an extensive lava plateau. As the lava cooled rapidly, contraction occurred. While contraction in the vertical direction reduced the flow thickness (without fracturing), horizontal contraction could only be accommodated by cracking throughout the flow. The extensive fracture network produced the distinctive columns seen today. The basalts were originally part of a great volcanic plateau called the Thulean Plateau which formed during the Paleogene period. A similar structure, known as Fingal’s Cave, can be found in Scotland.